The pietra dura is therefore an art technique of lapidary marquetry. The works in pietra dura often represent floral motifs, plants, or natural settings. More recently this technique is used to represent geometric shapes. The words "Pietra dura" come from Italian, it means "hard stone", but also "semi-precious stone". This is an inlay technique. The principle is simple: First, a drawing is made, usually it is floral, but not necessarily. The motifs of the Taj Mahal are in large floral parts, precisely, and when they are not they are at least vegetal. The artist then realizes a marble plate that will serve as a support, it must be of the right size, relatively thick and above all perfectly flat. The next step is to prepare the different pieces that make up this stone puzzle. Indeed, the design invariably provides different geometric shapes more or less complex, but still reasonable size. They must be cut into the stones whose color will correspond to the desired color on the final work, for each piece. This choice of color is essential, it is he who will give the general appearance of the work. The artist must also be concerned about how to cut the stones, it is necessary, in addition to being of the adequate size, that they are of the good depth. However, there may be a slight difference in height because the whole will be abraded and polished at the end. Once the stones cut to the right dimensions the artist takes care of the support. The marble slab must be strong enough to support the many cavities that need to be created. Each hole must perfectly match a stone. This is all the skill of the artist since the most suitable for this work will provide parts with no joint, while the others will have to put a binding powder. Once finished, which can take a lot of time, you still have to abrade the plate to level out any small differences in level that may be, then polish the whole to make the job neat. It is only from this moment that the artist can estimate his finished work. The technic of pietra dura is a Florentine invention of the end of the 16th century, at the time of the Medici. It is Francis I of Medici, born March 25, 1541 in Florence and died October 19, 1587 in Poggio a Caiano, who is the promoter of this art in Florence. At the end of his life he created a workshop of stone marquetry and brought the best workers, the lapidaries, to the spot. By pooling their knowledge they developed tools and techniques peculiar to them, which gave the necessary impetus to this art. Pietra pieces from this period are world references, they are partly gathered in a museum dedicated to this art, "the office and museum of pietra dura". The end of the rebirth is a period during which the nobility tried to distinguish themselves, each sought a way to put forward, and the pietra dura was one of these levers. It is thanks to this that this technique could survive and even continue to develop, because each piece that was provided was immediately exposed to highlight the taste of luxury and curiosity of those who had the chance to contemplate the work. At the same time the lapidaries began to use more and more frequently semi-precious stones or even precious, which was asked more and more often by the baroque art which reigned then on the artists. At that time, the more the works were flashy, the more they liked. There was also another reason why the pietra dura was reinforced in the Baroque period: The use of precious stones allowed to better separate social classes, which was desired by the nobility. During the seventeenth century, lapidary art experienced an acceleration of its diffusion. Conquered by the quality of the work of the Florentines, the monarchs of all Europe created workshops and brought artists to teach them this science, since it may be called so now that knowledge spreads. Thus we see workshops in Prague, under the impulse of Emperor Rudolf II, in Madrid, Germany, & c. The Mughal Emperor Shah Jahan chose to inscribe floral motifs as the Taj Mahal by seeing some pieces already made. During this period it was built a very large number of pieces in pietra dura and as it is, in essence, works intended to last, we find them still today in museums. The decline of the pietra dura happened during the nineteenth century, the industrial era, which made all that required a manual work. At that time, it was the reign of the machine-king, but nobody was yet able to create a machine that could replace the hand of man in this delicate work. The know-how was partially lost because it still survived in Italy, Florence of course, and it is still there that we find masters lapidary able to work according to the technique of pietra dura. Where do you see pieces of pietra dura nowadays? Nowadays, such plays are mainly found in museums, but it is not uncommon to find them in private homes. The museum pieces are particularly beautiful, large, while individuals will rather own small works as small objects. The largest collection in the world is in Vienna, at the "Wiener Hofburg". It contains 67 paintings done with this technique, as well as many cabinets and sumptuous tables. 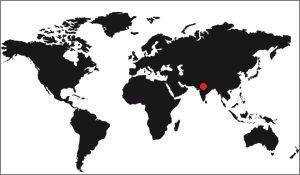 But Germany has also kept its main pieces in various museums in the country. This country exhibits in the "Münchner Residenz" ten tables that come from Florence. Some churches in northern Italy have kept the altar tables in pietra dura. In France there are museums that exhibit some important pieces, but it is not the most characteristic art of the court of kings of France. The decorations of the Taj Mahal are made largely in high quality pietra dura, which partly explains the beauty of the mausoleum. There are a very large number of different patterns, often repeated in large quantities. For example on the rough marble fence that surrounds the two cenotaphs, in the center of the mausoleum, there is a large number of flowers repeated around, alternating two different types of flowers. 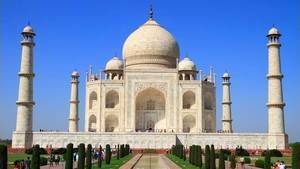 It is also necessary the precision of the execution of the pietra dura of the Taj Mahal, the experts admit that it was made by people really mastering their art. 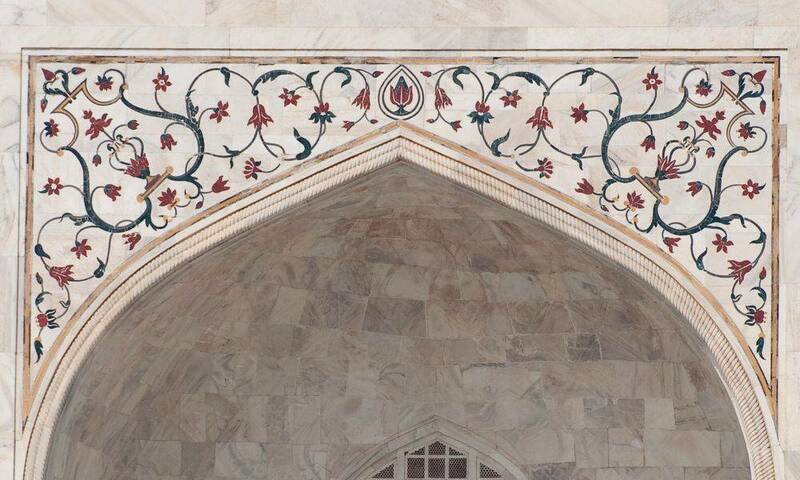 It is also important to know that the mausoleum is not the only building to receive pietra dura at the Taj Mahal, the mosque and the guest pavilion also have some, albeit in smaller quantities. 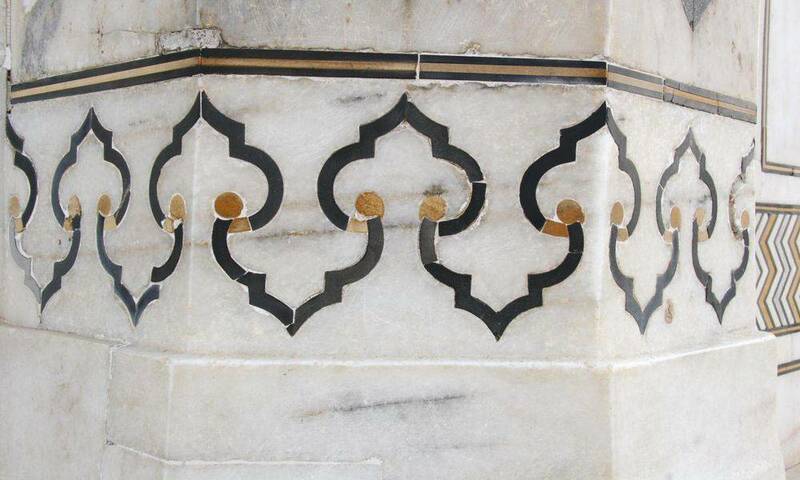 Finally, at Taj Mahal, the pietra dura represents only flowers or geometric patterns. It is voluntary, Shah Jahan, the builder, being a Muslim, there could be no human representations (on the one hand) and the flowers are a representation of Paradise according to Islam (on the other hand). That's why we only meet flowers here, or when the motif had only a decorative purpose, meaningless, he had geometric patterns put on it. Decorations of the Taj Mahal. 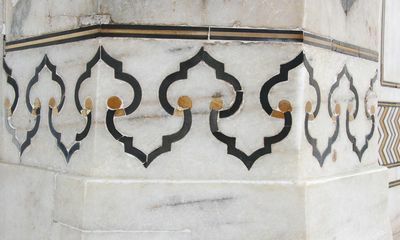 Inscriptions on the Taj Mahal.